The LC2 Petit Modele Armchair is arguably one of the most famous and successful items from the iconic Le Corbusier furniture collection. With its squishy, welcoming cushions, the armchair entices you to sit down and relax. The LC2 was designed as a fresh, modern take on comfortable, ponderous armchairs found in the elite gentlemen's clubs. The LC2 was designed in 1928 and brought to the limelight one year later, at the Salon d'Automne in Paris. It comes from the furniture collection, which was a product of the collaboration between Le Corbusier, Charlotte Perriand and Le Corbusier’s cousin, Pierre Jeanneret. In 1928, Le Corbusier, who so far had been mostly known as the modernistic architect and urban planner, under the influence of Perriand, began his involvement with furniture design. While working on the furniture line, Le Corbusier successfully applied his architectural philosophy of placing mankind’s needs at the center of his designs. As the result, the LC2 Petit Modele Armchair is perfectly tailored to the ideas of rest and relaxation. The “Cushions Basket”, as its creators used to refer to their new armchair, was a result of taking up the challenge of redesigning the 19th century concept of the English armchair. The goal of the designers was to make a very welcoming and extremely comfortable armchair, which would remain faithful to the minimalistic principles of the International Style, which was pioneered by nobody else but Le Corbusier. The LC2 is deprived of any ornamental features or bourgeois forms in favour of elegant simplicity and functionality. The design is refined down to essentials making the form of the armchair very minimalistic and pure. One of the most distinctive features of the LC2, is its external, chrome coated frame. It consists of the base grate and three tubular steel profiles with a circular cross-section. The front legs of the armchair are made from a single tube, which also goes around the entire periphery of the armchair providing support for the cushions. In the original chair, this element has no sharp corners, due to the bending process utilized in its production. However, a multitude of imitations have this element made from several separate pieces, which are then welded together at a 45 degree angle, thus making the corners look sharp. The back legs are made from two vertical pipes welded to the peripheral tube. All four legs are finished with nickel-plated steel glides and are spanned together with thin, circular rods. It improves the structural strength of the armchair, making it more sturdy. The final element of the frame is the horizontal grate, which is welded to the legs and keeps all the cushioning above the ground. The entire frame creates a basket, which accommodates very thick and resilient cuboid cushions. They are manufactured from the multi-density composite foam and are available in either down- or Dacron-wrap versions. There are five cushions in total; two serve as the armrests, one as the backrest, and another two as the seat. The cushions are upholstered in top-grain semi-aniline leather, which is available in six colours, including the following: Anthracite, Chocolate, Dark Brown, Graphite, Tobacco and White. The LC2 provides an outstanding level of comfort and relaxation. However, it not only caters to one’s physiological needs, but it also appeals to the most sublime tastes of any aesthete. The overall appearance of the armchair is extraordinarily appealing and stylish. It is very proportional and well-balanced and the use of the external frame makes it look both airy and light. Even today, almost nine decades after its presentation, when modernism is not an extravagant or radical concept anymore, the LC2 has neither aged nor become trite. It still looks fresh and contemporary. The LC2’s sibling, the LC3, shares almost identical design with its ‘cubical twin’. However, as the name suggests, the LC2 Petit Modele Armchair is more compactly scaled when compared to the LC3. The LC2, despite its significant age, is still in production. 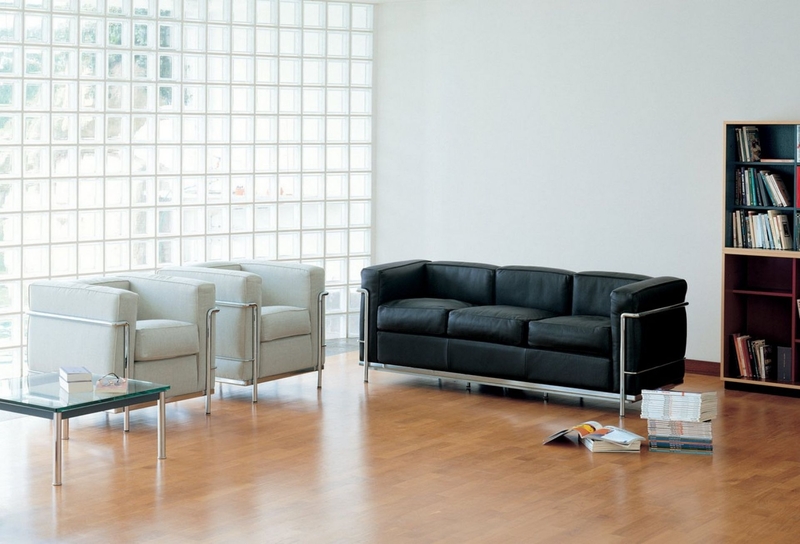 It is commercially available under the brand name of Cassina, which wields an exclusive worldwide license from the Le Corbusier Foundation. Each armchair, as a product of Cassina's Masters Collection, is signed and has a unique serial number engraved on the frame. Although the most popular variant of the LC2 has the chrome coated frame, the armchair is also available with its frame painted in colours chosen from the "color keyboards" that Le Corbusier developed in the 1930s and 1950s.